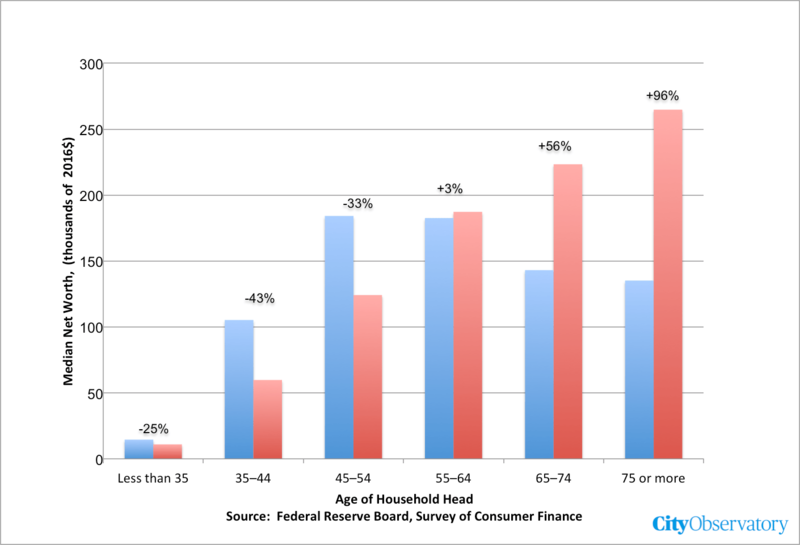 Is the “dream” of homeownership really just a massive, intergenerational wealth transfer? Recently, that’s just how it has worked out. Homeownership is a gerontopoly. Most housing wealth is held by older Americans. Inequality in the US is increasingly intergenerational. The old get richer and the young get poorer. Most of the growth in intergenerational equality is fueled by home ownership. More older Americans own homes, own more valuable homes, and owe less debt on these homes. 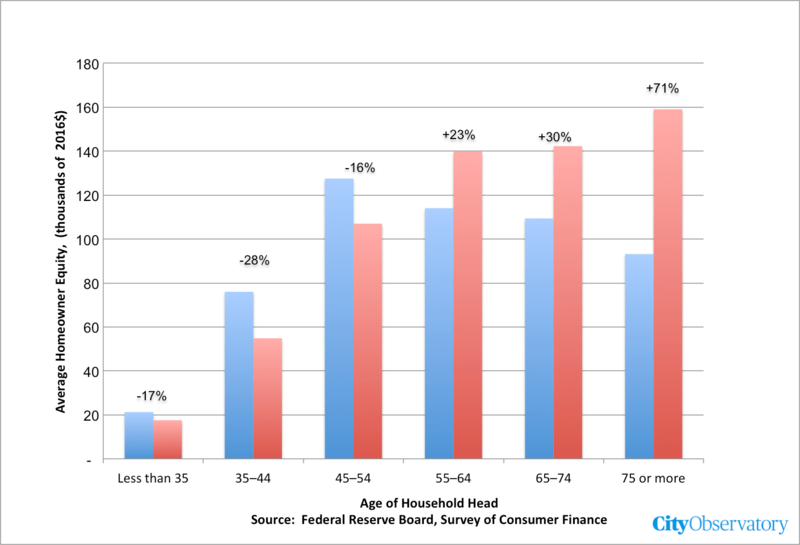 Homeownership isn’t making younger generations wealthier. Rising real home prices effect a transfer of wealth from younger generations to older ones. The growth in inequality in the US has been much studied. Over the past several decades, the distribution of income in has become much more skewed, with nearly all of the increases in real income accruing to the highest income households. Not only has income become more unequally distributed, so too has wealth. As Matthew Rognlie showed virtually all of the increase in wealth inequality in the United States in the past four decades is accounted for by the increase in the share of capital in housing. Mian and Sufi plotted the ratio of the amount of home equity owned by the highest income quintile compared to the middle quintile of the US population. In the 1990s, a household in the highest income quintile had about 5 times as much housing equity as the average, middle quintile. By 2010, this difference had nearly doubled: to 9 times as much housing equity. Because of the volatility of home prices, and the systematic way in which financial markets favor the wealthy, homeownership actually contributes to increased inequality. A recent study by the Federal Reserve Bank of New York shows that since the housing bubble, a much higher share of homeowner equity has been accumulated by households with the highest credit scores. There’s a strong generational component to inequality. Over the past several decades, older Americans have done relatively well, while younger Americans have struggled. Some of the most comprehensive data on wealth holdings by American households comes from the Federal Reserve Board’s triennial Survey of Consumer Finances. While most other statistics focus on measures of income, the Fed survey asks a representative sample of homeowners about home ownership, car ownership, financial holdings, and all kinds of debt from credit cards and student loans to home mortgages. These data are broken down by a number of demographic categories, including age. This figure shows the median net worth of US households by the age of the head of household in 1989 and in 2016. Data are expressed in inflation-adjusted 2016 dollars. Since 1989, the all of the net increase in wealth has been experienced by households now aged 65 and older. The wealth of those aged 55 to 64 is essentially the same is in 1989 (up just 3 percent); those under 55 are decidedly poorer; the average wealth of those 35 to 44 is 43 percent less than in 1989, and for those 45 to 54, is 33 percent less than in 1989. For most American households, their largest asset is the home that they own. It’s little surprise therefore that change in age-related income inequality are mirrored in patterns of home equity. Today, a smaller fraction of young households owns their homes than in 1989; and as a group, they consequently have much less home equity per household. Meanwhile, homeownership rates have actually increased among older households, and in addition, since fewer of them have significant mortgage debt, and have on average owned homes for several decades, have much more equity. This chart shows the average (mean) level of homeowner equity for households, by age of household head. Again, data are expressed in constant 2016 dollars. We’ve estimated mean equity by multiplying the homeownership rate for each age group by the mean level of home equity for homeowners in each group (the difference between home value and outstanding mortgage debt on principal residences). As a result, these data reflect the combined effects of lower homeownership among younger households, as well as accumulated equity by older homeowners. Overall, these data mirror the patterns of change in overall wealth. Those 65 and older have recorded substantial gains and the oldest households now have the greatest amounts of average housing wealth. Those under 55 have noticeably less housing wealth than did similarly aged households in 1989. In short, younger adults have seen their housing equity shrink precipitously, while older Americans have experienced a rapid increase in their housing equity. Housing wealth in the US has become increasingly concentrated in the hands of the nation’s oldest households. Today, fully two-thirds of all equity in owner-occupied housing is held by families headed per persons 55 and older. As we’ve pointed out at City Observatory, there’s an inherent contradiction between the goals of promoting housing affordability and using homeownership as a wealth building strategy. Affordability requires that housing be stable in price; a good investment needs to appreciate. If housing is a great investment, its because its becoming less affordable. If housing stays affordable, it is, by definition, not an investment that generates gains. When housing appreciates it does create wealth––for those who already own it. But that wealth comes from somewhere. Fundamentally, with a large, and long-lived housing stock, homeownership is mostly about one generation buying an asset from a previous generation. Economist Ed Glaeser explains this in a recent article in the Journal of Economic Perspectives. Because homeowners tend to be older while renters are younger, the limited growth in housing supply has created an intergenerational transfer to currently older people who happened to have owned in the relatively small number of coastal markets that have seen land values increase substantially. The only gainers in housing wealth over the past 3 decades have been older Americans. Those under 55 today have accumulated far less housing equity than previous generations. For boomers and the greatest generation, homeownership worked out well as a wealth building strategy. But in large part that’s because they followed the old investment adage, “buy low and sell high.” If you could buy US homes at 1970s or 1980s prices and hold them for decades (as many of today’s 55 and older homeowners have) you’ve reaped a substantial investment gain. But for those who bought more recently, especially in the height of the housing bubble, the road has been considerably rockier. They’ve already fallen dramatically behind previous generations in building equity, and the only way that they’ll catch up is if home prices accelerate further–which implies that housing becomes less affordable for everyone else.